Figure 1: An article from Washington Post, June 1, 1897. 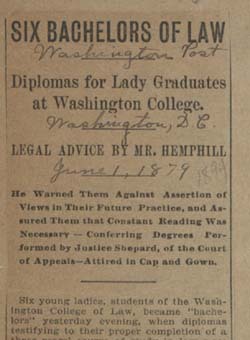 Courtesy of the Washington College of Law Historical Collection, American University Library. Used with permission. The Washington College of Law (WCL) was founded in 1896 by Ellen Spencer Mussey (1850-1936) and Emma M. Gillett (1852-1927). 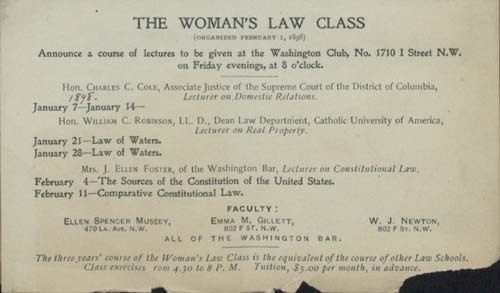 Mussey and Gillett opened the first session of the Woman's Law Class on February 1, 1896, in Washington D.C. The two did not intend to establish an independent law school but decided to do so when Columbian College (now the George Washington University) would not accept students from the Women's Law Class into its law school for their final year of education. The Washington College of Law was the first law school in the world founded by women and the first to graduate an all-female law school class. Ellen Spencer Mussey was the first woman dean of a law school. In 1897, the WCL enrolled its first male student. In 1949, the WCL merged with American University. The Washington College of Law Historical Collection from the Pence Law Library contains class schedules, correspondence, newspapers, programs, scrapbooks, and yearbooks documenting its history from 1896 to 1960. In addition, there are materials relating to the 1902 Encampment of the Grand Army of the Republic in Washington, D.C., Kappa Beta Pi (a legal sorority), and WCL founder, Ellen Spencer Mussey, and her family. In addition to current and former students of the WCL, this collection is invaluable for the study of the legal education system and the role of women in the legal profession. Researchers can study the growth of the WCL from the Women's Law Class to a formally accredited law school. The scrapbooks highlight the achievements of the graduates of WCL and feature many items documenting the activities of the D.C. Women's Bar Association, which Gillett and Mussey helped to found. As many articles deal with personal events such as graduations and weddings, they will be of interest to genealogists and individuals interested in the history of the Washington, D.C. metropolitan region. Anyone interested in women's history will find many examples of the challenges faced by women in the legal profession. The materials relating to the WCL include ten scrapbooks (1851-1960) compiled by alumni; five yearbooks (1926, 1936, 1938, 1940, 1981); WCL's student newspaper The Grit (1920-27); schedules of classes (1923-43); a roll book (1912-1918); and minutes from the Mussey Law Congress, a student organization (1935-1938). Figure 2: The Women's Law Class announces a course of lectures (1898). Courtesy of the Washington College of Law Historical Collection, American University Library. Used with permission. The Mussey Family is well documented by correspondence from Ellen Spencer Mussey's son, Spencer Mussey, to his parents from 1883 to 1894 while he was attending Lehigh University. Ellen Spencer Mussey's husband R.D. Mussey (1833-1892) was a Union Army General during the American Civil War and a distinguished lawyer. He served as commander of the 100th U.S. Colored Infantry. A scrapbook compiled by R.D. Mussey features newspaper and magazine articles and speeches covering a variety of topics including education, patriotism, and slavery. Ellen Spencer Mussey's father, Platt Rodgers Spencer (1845-1860), was originator of Spencerian penmanship, which became the most widely known system of writing instruction in the United States after about 1850. A ledger book written by Platt Rodgers Spencer is also included in this collection. Ellen Spencer Mussey served as Chairman of the Women's Citizens Committee for the1902 encampment of the Grand Army of the Republic in Washington, D.C. Two scrapbooks in this collection document the planning for the encampment and its events through invitations, newspaper articles, photographs, and programs. Judge Clarence Opper, a graduate of WCL, was a member of the American Legion and active in veteran's affairs. His collection of newspaper and magazine articles, speeches, publications, and excerpts from The Congressional Record focus on the history of the American Legion. Three scrapbooks pertaining to Kappa Beta Pi Legal Sorority contain newspaper articles, invitations, photographs, and programs, which document the activities of Kappa Beta Pi and its members. Articles discuss everything from weddings to admittance before the U.S. Supreme Court. Of note are materials relating to Kappa Beta Pi's 1951 Convention in Miami, Florida, and Grand Dean Elizabeth F. Reed's travels across the United States. 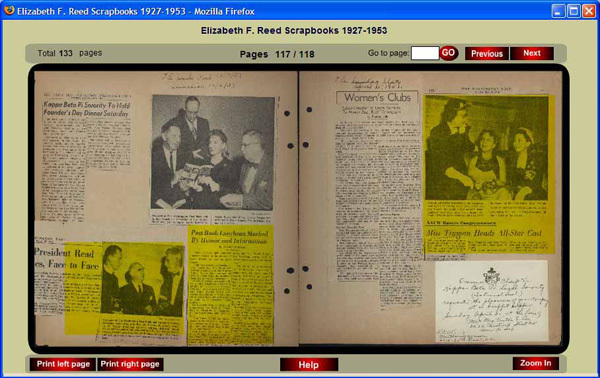 Figure 3: Screenshot of a flippable scrapbook. Courtesy of the Washington College of Law Historical Collection, American University Library. Used with permission. This digital collection is built using the Greenstone Digital Library software . There are three different viewing options for the different types of materials in this collection. The yearbooks and the student newspaper The Grit are full-text documents and were created in PDF format that can be searched and viewed in PDF Reader. The Mussey Family Correspondence contains 93 hand-written letters and postcards in JPEG format. These can be viewed through the image viewer provided by the digital collection. The most interesting and challenging materials are the scrapbooks, which were created using Macromedia Flash as animated flippable scrapbooks. You can flip through a scrapbook by clicking or dragging the pages. You can also enter a page number to see that page. You can use the zoom-in button to see details of each page. If an item on a page is highlighted, you can click the item to see a large version and images underneath. You can also print pages from the scrapbook. Figure 3 shows the features of the flippable scrapbook. Tips and instructions for viewing the digital collection are provided on the help page. This digital collection was made available to the public in October, 2008. It can be accessed at <http://www.aladin.wrlc.org/gsdl/collect/wcl/wcl.shtml>.